"Selecting Personalisation Software that best meets your needs & budget"
Although ecommerce is now a relatively mature industry, the software solutions that form the basis for the industry are still very much evolving. So, if you’re in the process of selecting personalization software where should you begin and what questions should you ask? 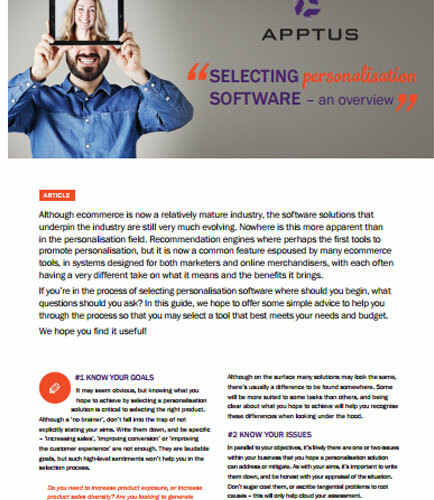 This whitepaper offers some simple advices to help you through the process so that you can select the personalization software that best meets your needs and budget. Have you sense-checked your requirements and selection criteria with a third-party? Where you sit on the maturity curve has implications on how you should conduct the selection process? If you find yourself revising your scorecard during the selection process, can you fairly apply the new criteria to all prospects, or do you need to restart the process? Have you identified reference clients who have similar requirements of software to your own? The use of computers, storage, networking and infrastructure to produce, process, manipulate, store, secure and share electronic data is known as information technology. First appearing in an article published in the Harvard Business Review in 1958, IT is considered a subset of ICT (Information communication technology). IT industry has progressed in leaps since its introduction. It has now become so integrated into our lives that it is impossible for us to think of a world without it. What is business process management ? Business process management is a systematic approach to business processes of a company which cover how we think, change, and monitor business processes so they run easily and can be enhanced after some time. BPM (Business Process Management) is a field of management that acts as a systematic approach for making organizations Workflow more effective, more efficient and hence improving the corporate performance by managing business process in the organizations.